I finally took the last step into the outside world by overcoming my sense of perfection and be happy with the imperfect. So this blog will document my further journey with vegan food and photography but not solely, as I am excited to see what the future brings. 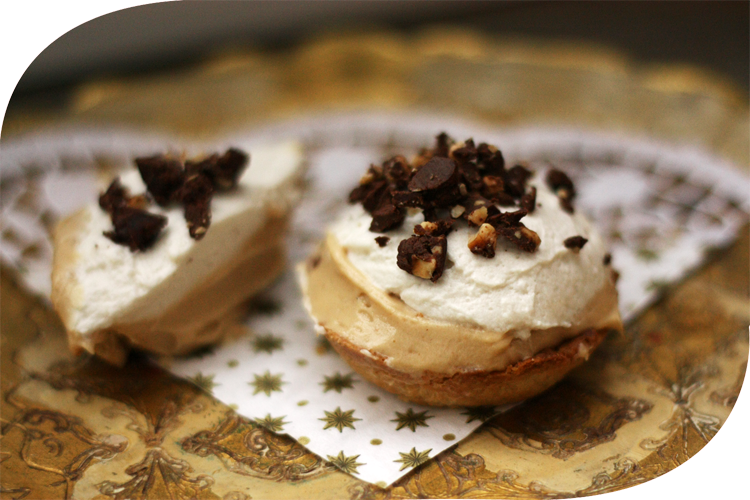 It is somehow strange that it was a tragic death and the reaction of the food blog community that brought me here today with a recipe of Vegan Peanutbutter Cream Tartelettes. I shared them with my family as I was having a hard time believing in myself and felt a strong urge to share this recipe. Combine the flour and salt in a small bowl. I recommend sifting the flour, but this is optional. Mix in the vegan butter using your hands, until there are only small crumbles. Add the cold water, the dough should now start to hold together. As I didn't use a pie dish, but cute tartelette tins, I didn't roll out the pastry crust, but took pieces from the dough and pressed it into the tin. Don't forget to grease the tins, this makes it a lot easier to get the crust out after baking. Using a fork, poke a few holes in the bottom of the crust to prevent air bubbles. Bake for about 10 minutes, or until the edges are golden brown. Now to get the thick part of the coconut milk, place it in the fridge overnight. Then skim off the thick cream at the top and put it into the bowl of your stand mixer. Add the powdered sugar (you can use less or omit the sugar, if you like it less sweet) and beat the mixture for 2 minutes, then add the vanilla extract and beat for another minute. Now add the soy whipping cream and beat until peaks form. Now set about 1/3 - 1/2 aside as the cream topping. For the filling add the peanut butter and beat until fluffy. If your mixture is too liquid, add more peanut butter or soy whipping cream and beat again. 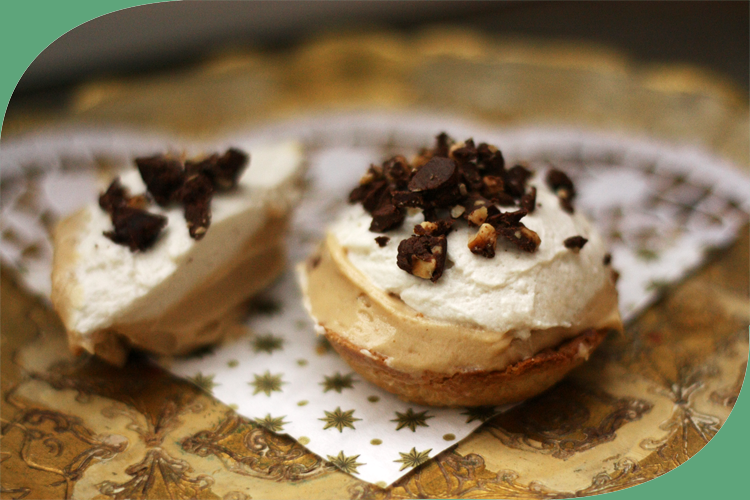 Fill your cooled tartelettes with the peanut butter mixture. Then spoon the remaining cream topping onto the filling and refrigerate the tartelettes for at least 30 minutes before serving. I hope you enjoy this recipe as much as I did. There's nothing wrong with changing it, adapting it to your taste or what you've got in your pantry as you can't really mess it up. Looks delicious and healthy! Can't wait to try this out. This would be nice during my movie marathon.